Select “general” on the “setup” screen. “English”, “français” or “español” can be selected. Select to set automatic screen changes from the audio control screen to the home screen on/off. 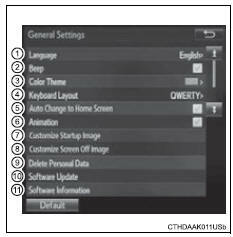 When set to on, the screen will automatically return to the home screen from the audio control screen after 20 seconds. Select to customize the startup images. Select to customize the screen off images.